We must be ready for warmer weather or something because we have been making lots of salads. 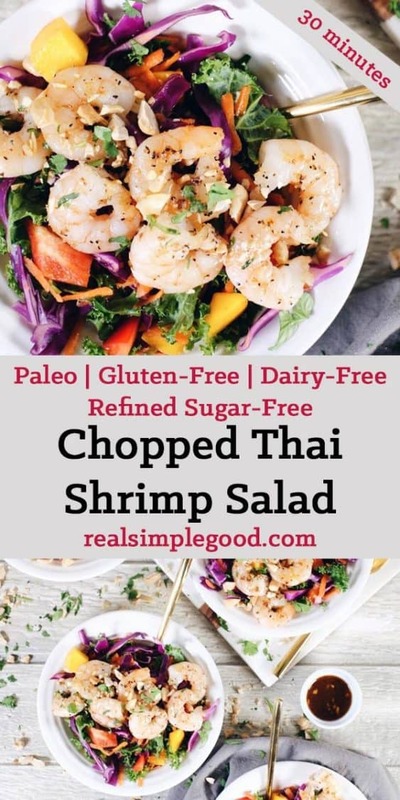 This chopped Thai shrimp salad is a new favorite! 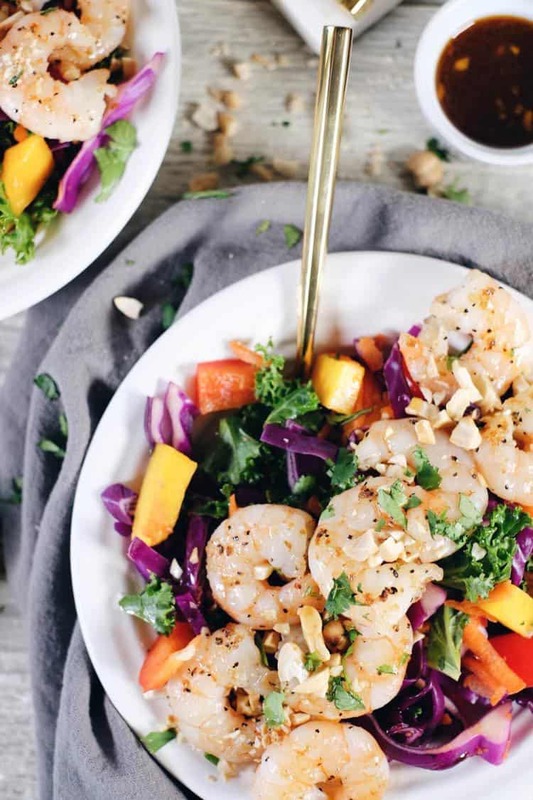 The best part about this salad is that it is full of colorful fruit and veggies. 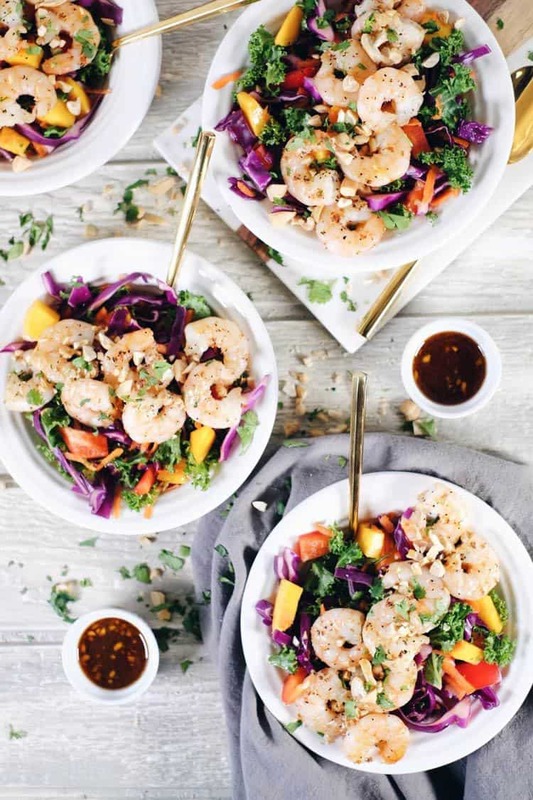 The most time-consuming part about making this chopped Thai shrimp salad is prepping the mango, kale, cabbage, bell pepper and carrots. It is so worth it though once you see the beautiful array of colors! Chopping up all the veggies is really the hardest part, and once the veggies are chopped and the salad dressing is made, all that is left to do is assemble the salad and cook the shrimp. And cooking the shrimp takes just a few minutes! That means that you could easily make the dressing and chop the veggies in advance and then have a super easy weeknight meal on your hands – like 5 minutes or so to get the meal on the table! If you choose to make it all at once you’re still looking at a 30 minute meal, which is great! 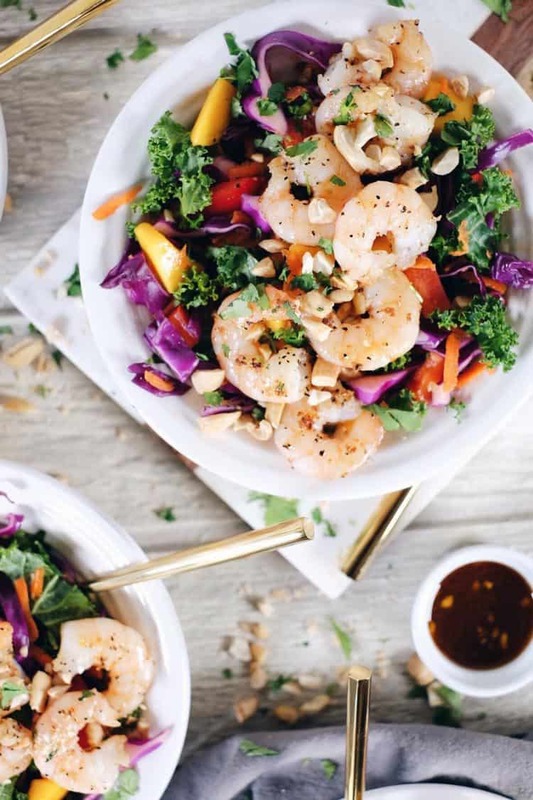 You could also substitute a different protein for the shrimp, so the possibilities are really endless for this simple and beautiful salad. Prep in advance or make this when you have only little time to spare. Either way, get ready to have a new favorite salad! Let us know how it goes by leaving a comment below. Also, take a photo and tag us on Instagram @realsimplegood, so we can check it out! 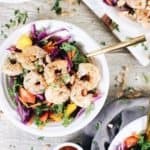 This colorful and veggie packed chopped Thai shrimp salad is a filling and easy meal. Make dressing by combining all of the dressing ingredients in a small jar or bowl and mixing well. Prepare kale, cabbage, bell pepper, carrots, mango and cilantro as noted. Place everything in a large bowl and toss to mix. Cut up cashews for topping and set aside. Heat a large skillet over medium heat and add in 1 tbsp avocado oil. Once the skillet is hot, add in shrimp to cook. Cook shrimp just a couple of minutes each side, until pink throughout. Season shrimp with salt and pepper to taste. Add dressing to salad bowl and toss to coat. 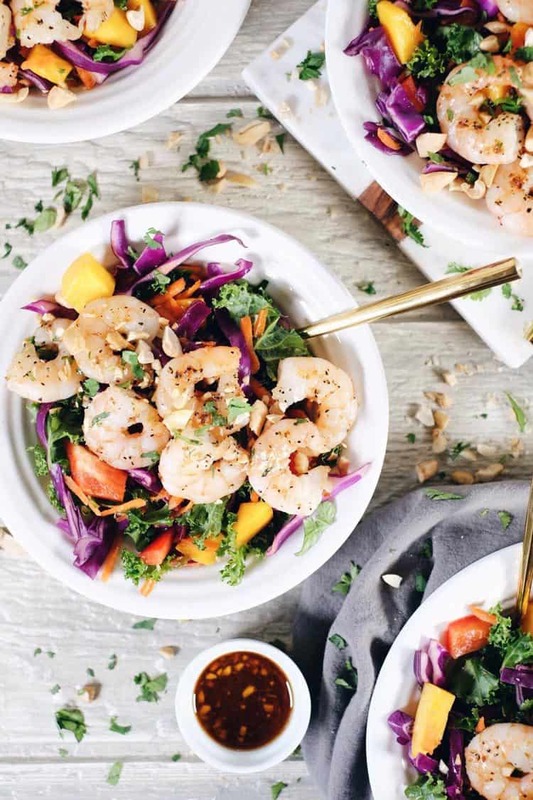 Serve salad topped with shrimp and chopped cashews. Enjoy.